Melt-in-the-mouth venison is ideal if you want something tender with lots of flavour. Here it’s combined with two classic Christmas ingredients. 1. Preheat the oven to 200°C, gas mark 6. Melt the butter in a large pan with 1 tbsp of the oil. Add the crumbs and garlic and fry gently for 5 minutes, until golden and crisp, stirring the mixture continuously. 2. Finely chop the cherries (or the apricots) and the parsley and sage. Stir into the crisp crumbs together with the clementine zest. Season and set aside to keep warm. 3. Heat a heavy bottomed pan over a very high heat. Rub the venison with 1 tbsp of the oil and season generously. When the pan is hot, put the remaining oil into the pan, add the meat and brown on all sides until caramelised all over. 4. Place the venison on a baking tray and place in the oven to roast for 20-25 minutes for medium, or longer if you prefer your meat well done. Remove and place on a warm plate, cover lightly with foil and leave to rest for at least 10 minutes. 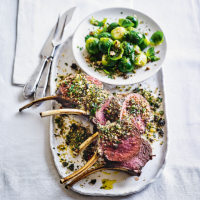 Carve the meat between the bones into cutlets and serve with a scattering of the crispy crumbs. Delicious served with beef gravy.